Tell us why you’re excited about coming to CTAConf… and we’ll send you fo’ free. TL;DR: Create a landing page telling us why you deserve to go to CTAConf and you could win an all-expense trip to Call to Action Conference in Vancouver (a prize valued at over $4000). You read the Unbounce blog regularly. You’ve taken the landing page conversion course, know the recipe for the perfect landing page and have seen many landing page examples. Now it’s time to show us what you’ve got. Why should we send you to the Call to Action Conference? You can start from a template or just piece together a page from scratch. Surprise us. Impress us. Anything goes! Create your page and then submit it via the form at the bottom of this post. What are we judging you on? Bonus: The early bird gets the worm. The earlier you get us your awesome landing page, the more time we have to look over it. Mark your calendars: The deadline for entries is Friday, August 28th. Our panel of judges will pick the best overall page (using our top secret algorithm) and we’ll post them on our blog in early September, just in time for the conference. Look out for a roundup of awesome reader-submitted landing pages (with a landing page optimization tip or two from some of our expert speakers and in-house marketing experts). In other words, why should you put your blood and sweat into making the best landing page ever? First of all, you’ll win your way to Call to Action Conference (ticket, airfare, accommodation and more), hosted by Unbounce this September 13th – 15th. Oh, and I almost forgot to mention. Second and third place will also win free tickets to the Call to Action Conference. Bethany Bauer’s page (complete with a video) absolutely blew us away. It blew us away so much that she won. Jen Salamandick’s landing page made us giggle. She showed us why she needed to go to the conference with a landing page that broke all the basic landing page principles. Attention ratio? What’s that? 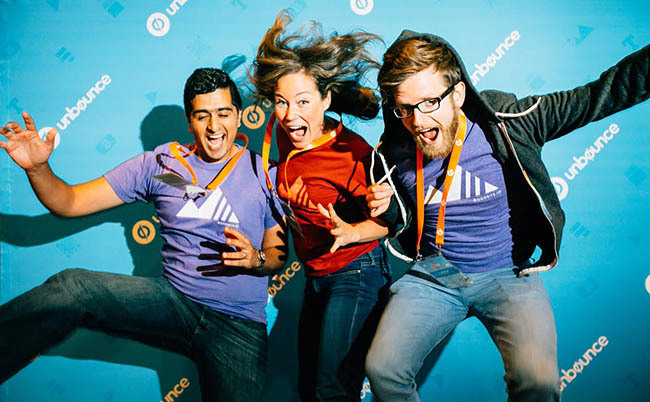 Create and publish a landing page in Unbounce (sign up here – it’s free) telling us why we should send you to CTAConf, and submit it via the form below. PS: If you don’t want to make a landing page but still wanna come to the conference, we’ve got a special discount for our blog readers. Get an exclusive 30% discount at checkout by using the promocode “UnbounceBlog” until the landing page contest submissions end on Friday, August 28th.